01 Jun Now is the time to order your 2018 advertising calendar! Why should you choose an advertising calendar in 2018? Advertising calendars are an essential corporate communication tool. More than just a simple object tucked away with the rest of the goodies for your customers, it enables you to gain customer loyalty and to remind them of your presence all year round. This customised advertising support, available in several formats, is without a shadow of a doubt the most practical gift to give to your clients at the end of the year. Practical and comparatively cheap, the advertising calendar helps you to build your brand image around the services that you offer your customers. The calendar transmits your company’s values to your customers, and can be augmented with a humorous image, citation, your slogan, your successes or your statistics etc. In this way you make sure that your customers and suppliers retain a positive image of your company or business. Margy Consultants have maintained a strong market presence for more than 20 years. We are at your service to help you transmit the ideal image of your company to your customers. Margy Consultants, with its expertise and experience with private and public organisations in the African market, will accompany, advice and propose different solutions to suit your needs. From its inception to the final printing, Margy will furnish the choices that will help your company to increase your revenue and make the difference in a market increasingly more competitive. Join the companies, embassies and institutions that have already entrusted Margy Consultants with their projects and chosen a quality product. Advertising calendars should be practical but also aesthetically pleasing. Your customers can consult them regularly, while at the same time keeping your logo and slogan in mind. With the calendar placed conspicuously on the recipient’s desk or wall, your company continues its promotion. It is therefore important to choose the right format and showcase to attract them. Discover the collection of calendars on offer at Margy Consultants. 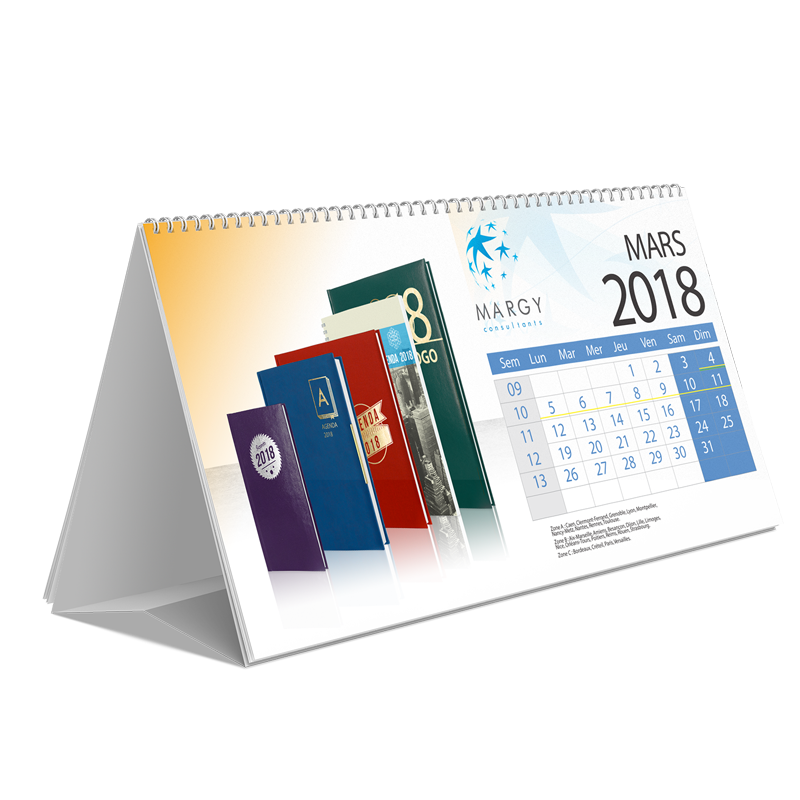 Communication professional, Margy Consultants propose several models that can be customised for your marketing campaigns, according to your customer’s specifications: banking calendar, desk blotter calendar, easel calendar or 3 month calendar. You will certainly find the format that suits you best. On the look out for the perfect gift for customers or prospects? Trying to improve your brand image? Don’t wait another second; and have your promotional products ready to be sent before the end of the year when workloads tends to be at a zenith. Our Internet site allows you to make a considered choice and to place your secured order. Thanks to its long experience and large-scale production, Margy Consultants ensure an optimal production with the earliest possible delivery date. We are equipped with the latest materials and are constantly scrutinising new techniques that appear on the market. Don’t hesitate to contact us if you have any questions regarding your projects or ideas about your creations.